Announcing Clicker 6 - Truly Amazing! NHSTE and Crick Software Inc. have worked together to create a statewide district licensing plan for New Hampshire Schools to purchase Clicker 5, a K-6 talking word processor, and ClozePro and WriteOnline, a writing support tool for students Grade 7 and above. Not only can you order these and save through NHSTE, but you can also order any Crick software products from us as well. We've made it simple for you to place just one order for all your Crick Software needs. Please click here to download the NHSTE discounted pricelist for all Crick products. Clicker is the award-winning literacy tool that enables students of all abilities to significantly develop their reading and writing skills. This year, Crick Software releases the latest version of this much-loved software – Clicker 6. Whether you are working in mainstream education or a special needs setting, Clicker is the perfect tool for helping all your students achieve reading and writing success. Clicker enables children to learn and progress within an easy-to-navigate, motivating environment tailored to their individual needs. Clicker 6 builds on the acclaimed support features of its predecessor. It combines customizable student support tools that empower children to work independently, with intuitive activity wizards that make it easier than ever before for teachers to create and edit Clicker activities. What’s new in Clicker 6? · Quick start word processor – Children are able to start working right away! · Primary word predictor - This intelligent predictor suggests words that fit the context of the student’s writing. · Enhanced picture library - Over 2,500 curriculum pictures, which are available for use in documents, Clicker Sets, the predictor, and the spellchecker! · Built-in painting tools – Crick’s popular painting program, Clicker Paint, is now fully integrated into Clicker. · Webcam support – Students’ photographs instantly appear in their Clicker documents. · Favorites list – Children save their favorite Clicker activities for easy future access. 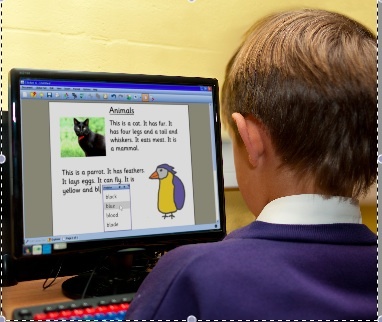 · Click & Edit books – This feature enables students to independently create their own talking books and presentations! · Clicker wizards - Follow the step-by-step instructions to quickly create personalized reading, writing, matching, labeling, speaking, and listening activities. · New editing tools - Editing activities made simple! When you click on a cell, the toolbar instantly changes to display only the tools relevant to the item being edited. · Faster access to LearningGrids - No need to login, access hundreds of free resources instantly from within Clicker! WriteOnline is the innovative new writing tool for schools and colleges. Word prediction, great quality speech and the unique Wordbar help students of all abilities to achieve their full potential. WriteOnline provides a powerful word processor, supported by a unique range of integrated writing support features. WriteOnline is accessible anytime, anywhere just by logging in online. Plus, you now also have the option of installing from CD, so you're not dependent on an Internet connection. ClozePro creates cloze activities which are a well-established and proven way of developing reading, comprehension and vocabulary skills. ClozePro enables you to create a cloze activity from any text in seconds! POs should be made out to NHSTE, PO Box 358, Georges Mills, NH 03751. Please indicate where you would like your order sent. Please include 20.00 per order for S&H.